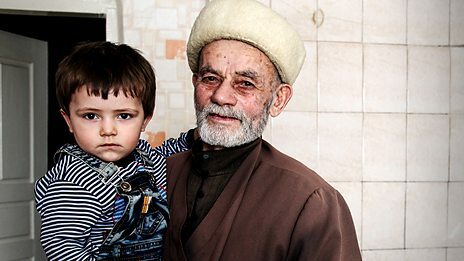 I recently listened to a moving programme on Radio 4 about the community of Chechen origin established in Kazakhstan in 1944, when many Chechens were forced to leave their homeland in the Caucasus mountains and were sent into exile to a totally alien environment on the bleak flat land of Central Asia. The radio programme – ‘Little Chechnya on the Steppes’ – is available to be listened to for the next 12 months or more – click here. Several images in the accompanying gallery of photographs show the men’s distinctive white hats. When the Chechens arrived in Kazakhstan with no possessions and totally unequipped to cope with the freezing cold of their new surroundings, they begged the local people to give them some means of keeping warm. They were given lambswool and lamb skins, from which they made the white hats which are now so much a part of their identity. As someone interested in dress history, I find it fascinating how an item of clothing can become so firmly linked to a person’s identity or history that it is used to define them. Other examples I can think of – ‘bluestocking’, ‘sans-culotte’, ‘pantaloon’, ‘black shirt’, ‘hoodie’, ‘anorak’, ‘saboteur’ (though the origin of this one is debatable – the ‘sabots’ were either the wooden clogs worn by protesting Dutch workers who sabotaged machinery, or were the wooden ‘shoes’ holding the rails in place, similarly sabotaged during the French railway strike of 1910). The displaced Chechens became known as the ‘byeloshapochniki’. In Russian: белошапочники – the White Hat People. I love the possibility in languages such as Russian and German of creating ‘portmanteau’ words – where several elements are combined to make a single term – as in бело (white), шапоч (hat), ники (a suffix indicating ‘people’). There was a time – I suppose around the 1960s when words such as ‘sputnik’ entered our consciousness – when this Slavic suffix was used to create new words in English: ‘beatnik’, ‘refusenik’, ‘peacenik’ etc. I came across this kind of word when I was doing some research on Russian ethnic dress and peasant life. Peasant girls or boys were expected by their community to be able to perform various tasks by a certain age. Girls had to learn how to spin, set up a loom and weave linen, and boys had to become skilled at making footwear (lapti) out of bast (the inner part of the bark of lime or birch trees). If a young person did not acquire the skill by the appropriate age, they were given derisory nicknames. The boy who couldn’t make lapti (singular: lapot) was mocked by being called a byezlapotnik – meaning someone without a lapot.